The exterior of The Connolly is certainly striking. 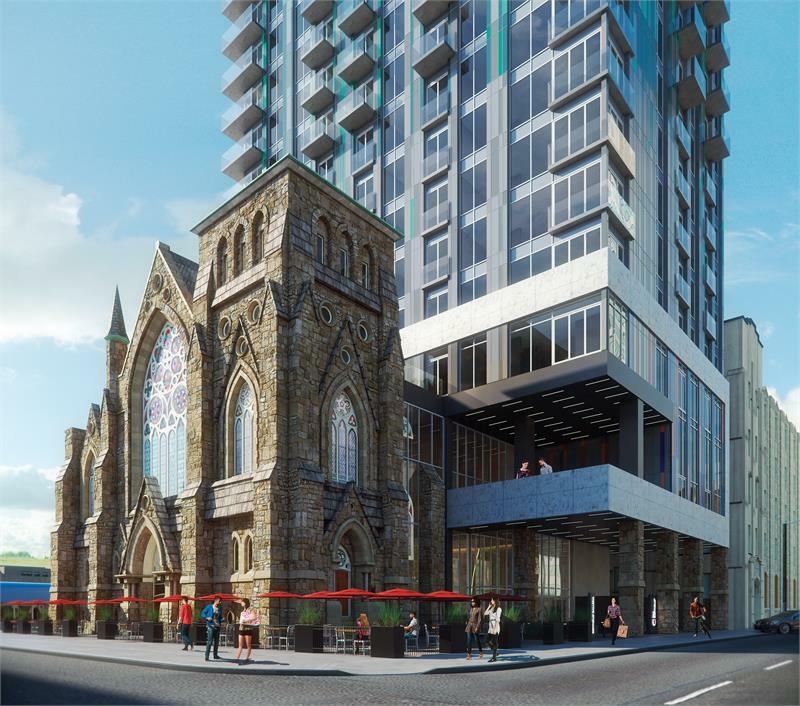 Situated at 98 James Street South in Hamilton, the new mixed-use structure will incorporate elements of the church that has stood on the thoroughfare since 1882. The unique 30-storey building will incorporate refurbished stone, stained glass and architectural elements of the existing structure. It will also see a blend of commercial and retail space as well as new residential units that will animate the space. Stanton Renaissance is ensuring that the same level of care in creating a visually appealing exterior is also carried through within. One of the most dramatic plans includes a public Galleria in the restored portion of James Street Baptist church, a great space for people to mix and mingle. In terms of the residences, each of the suites will feature nine-foot, flat-smooth finish ceilings and plenty of other fine finishes. Residents will enjoy kitchens outfitted with their choice of Ceasarstone or quartz countertops, available in a variety of colours. There’ll be plenty of storage in the contemporary Euro-style cabinetry, also available in a series of smart colours. A range of appliances will also be included such as a stainless steel fridge, dishwasher, wall range, cooktop and microwave with fan. Beyond the kitchen, each unit will also come with a modern stackable washer/dryer or side by side washer/dryer set. Bathrooms will feature porcelain floor tiles and lavish, five-foot soaker tubs and contemporary Euro-style floating bathroom vanities. While functionality and style may be key components of The Connolly, its place in the city is also noteworthy. Two GO Transit stations will be within walking distance of the mixed-use project. Just seconds away, the Hamilton GO Centre features both train and bus service as well as connections to the Hamilton Street Railway (HSR) buses for local trips. Plus, there’s even more transit connectivity on the horizon. The new James Street North GO Station, which is currently under construction, will be a 15 minute walk away and make travel to and from Toronto a snap, with commuter travel between the two cities both in the morning and the afternoon. We’ll be following the project closely and provide you with more details as they become available. For more information contact info@theconnolly.ca or visit theconnolly.ca.